This is another big knife I'm working on. Actually, there are two very similar big knives for the same client, this is the first one I'm doing, it's a Dozier. 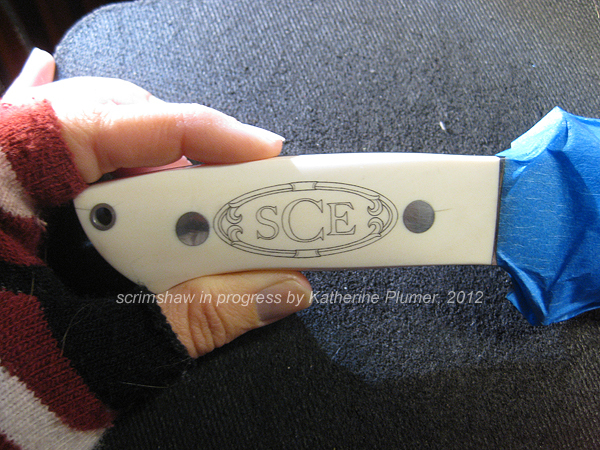 This is the back, with my client's monogram. I didn't know anything about monograms until I got into this engraving stuff. I used to think "why so much emphasis on the middle initial?" Ah, but in a monogram, the last name's initial is moved to the middle, and is often bigger than the other two! Nifty, eh?